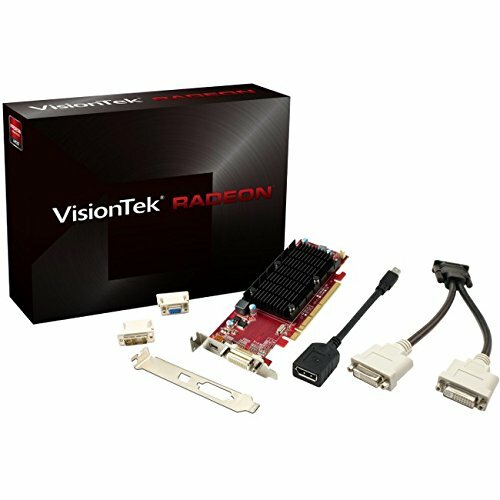 The VisionTek Radeon HD 6350 graphics card offers the most features and functionality in its class with complete DirectX 11 support and the world's most advanced graphics, display features and technologies. It's designed to be the heart of a feature-laden gaming/computing PC experience that delivers exceptional HDMI visual and audio quality Play your favorite game, watch a Blu-ray or HD movie, attend a video conference, run demanding creative production apps across three monitors... this card has the power to handle all your display needs with intelligent power management that doesn't compromise performance. Its Small Form Factor (SFF) design comes equipped with a short bracket for a quick installation in today's low profile desktops and workstations. Yet, with the included tall bracket, the card easily adapts for use in a standard PC chassis. Small Form Factor - Low Profile Design: The innovative low profile design allows installation in small form factor and systems. Energy Efficient Intelligent power management technology allows the VisionTek Radeon HD 6350 to conserve energy at idle or when demand is low. Improve Your Productivity: Take multitasking to the next level by expanding your visual workspace! Eyefinity Technology with DisplayPort connectivity lets you view three DVI-D monitors simultaneously so you can get more done in less time. Avivo Video and Display Technology connects to high-resolution displays and home entertainment devices and produces vibrant colors, ultra sharp images, and smooth video playback.